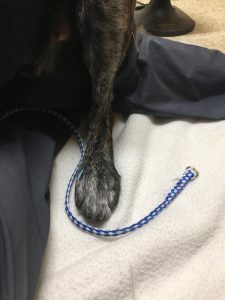 Ceibo is a 7 year old Shepherd mix who presented for vomiting and suspect foreign body, but after abdominal explore and biopsies, was diagnosed with severe inflammatory bowel disease. In the post op period, using parasympathomimetic points and points to stimulate GI motility as well as esophageal sphincter function, he stopped regurgitating and began to eat more and defecate. He now has normal energy level and appetite. He hopefully will be maintained with acupuncture for his GI function and inflammation as well as keep up with an appropriate diet for his IBD. Ceibo had been vomiting for 3 days prior to presentation, following a camping trip. He had gotten into numerous food items at the campsite and they gave him a corncob to chew on. He vomited a small piece of the corncob that night. He continued to vomit whenever he ate any food or drank water. He has no history of previous GI illness, and no vomiting or diarrhea had been noted prior to the morning after giving the corncob. The clients did note after we weighed him that Ceibo had lost weight since he had been seen at a previous veterinarian. Ceibo was lethargic/ dull on physical exam. His abdomen was sensitive to palpation. Radiographs and contrast radiographs were consistent with delayed gastric emptying. An exploratory surgery was performed and no foreign body was found. However, the small intestines were severely thickened and the mesentery was full of white material. Biopsies were taken to send for histopathology. Ceibo went to the E-clinic for overnight monitoring, where an NG tube was placed. Radiographs taken overnight for placement confirmation showed there was still contrast in the stomach (roughly 15 hours after the contrast was given). Ceibo returned for monitoring during the day. He was still lethargic and did not want to eat or defecate. He regurgitated overnight as well as for the first few days of hospitalization. He urinated normally. His abdomen was still sensitive.. During his myofascial palpation, he was sensitive over his thoracolumbar spine, particularly around T13-L4 region. He was also sensitive in his cranial thoracic area just caudal to his scapulae. My acupuncture approach was aimed at stimulating the autonomic nervous system to encourage GI motility. I wanted to increase parasympathetic stimulation as high parasympathetic tone promotes digestion. I also wanted to try and decreased the tone in the pylorus to try and promote gastric emptying. I also wanted to try and reduce nausea, increase appetite and tighten esophageal tone to reduce regurgitation. Abdominal pain due to the biopsies, abdominal wall surgery and underlying cause was always a concern as well, and he was very sensitive throughout. Massage of the tissue was more realistic in his case than acupuncture points along his ventrum in the immediate post-op period. Inflammatory Bowel Disease + lymphangiectasia — based on histopathology. Throughout the first 3 treatments while Ceibo was hospitalized, he was on IV Fluids, omeprazole, metronidazole and metoclopramide. Laser was not performed because GI lymphoma was a differential diagnosis, and histopathology had not been returned. Dry needling and massage were the methods used. First Treatment (2nd day post op) – dry needling only for 20 minutes. ST 36: neuromodulation and parasympathetic tone. BL 18: Try and address the sensitivity in this area as relating to spinal pathways affecting his stomach and esophagus. BL 21: Back Shu point for the stomach – try and neuro-modulate the pathways centrally from the spine to promote gastric emptying. PC 6: To try and address the lower esophageal sphincter tone to prevent regurgitation. Patient was more amenable to placing more needles. He was also brighter. He ate a few bites of EN canned food and did not regurgitate visibly. CV points were massaged again, as the patient tolerated this well previously. ST 36, LI 4, Bai Hui, GV 14, GV 20: Repeated for parasympathomimetic action. Ceibo accepted LI 4 and allowed it to remain for 15 minutes. BL 18, 19, 20, 21 were stimulated for stomach spinal pathways as well as due to sensitivity on myofascial palpation. Repeated the same treatment as day 2. Ceibo tolerated this session the best and even fell asleep in the techs lap. He did well overnight at home – did not regurgitate. He ate a little more of the EN canned food while at the clinic. Ceibo was sent home after this session. Ideally he would have had more treatment weekly for his IBD. Currently, he is doing well. Although one may argue that Ceibo would have improved regardless of the acupuncture, I think it shortened his hospital stay and quickened his recovery. 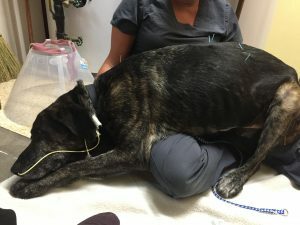 Stimulating his own nervous system to promote movement of ingesta in his stagnant GI tract, allowed him to feel better and keep down nutrition and fluids. I believe that his helped his medications to work better and improve faster. I would like to continue acupuncture treatments on Ceibo to control his clinical signs associated with IBD as it will be a lifelong disease for him. Gao and Bai found that stimulating GV points reduces instance of Gastro-esophageal reflux disease (GERD) in people. Gao, L J, and X H Bai. “Clinical Trial of Acupuncture Treatment of Gastro-Esophageal Reflex Disease by Needling Dorsal Segment of the Governor Vessel.” Zhen Ci Yan Ju, vol. 41, no. 2, Apr. 2016, pp. 150–153. PubMed, www.ncbi.nlm.nih.gov/pubmed/27323443.